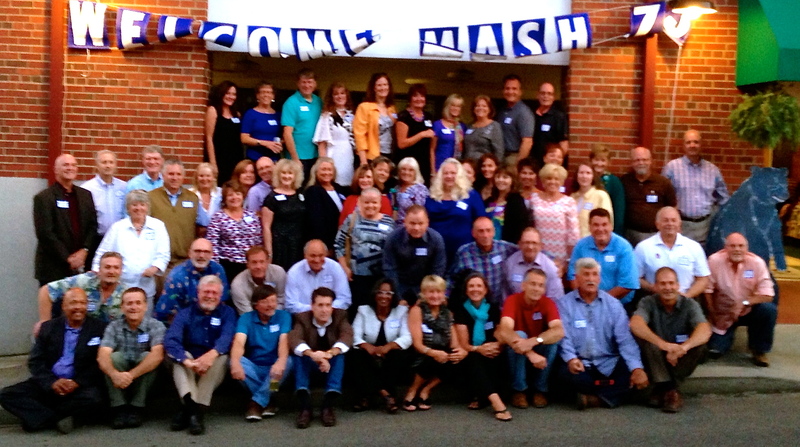 I have been looking forward to/dreading my 40th high school class reunion for quite some time. It’s been a tough year for me and for my family. I haven’t reached the goals (mostly weight) that I wanted to reach before I reacquainted myself with my lifelong classmates. Even though I don’t live in the town I grew up in, I have kept up with many of my friends on Facebook and actually feel very close to them. I wanted very badly to see several people. I couldn’t let a little (big) thing like how I perceived how I looked, keep me from seeing the people that have been so supportive and uplifting this past year. The planning committee did a great job for this reunion. I have a suspicion their planning was just as much fun as the reunion! I was amazed at the turnout we had. While this is not official, I would guess, we had at least 1/2 of our class there. Maybe as much as 2/3. There were people there from all over the US. Kitten was kind enough to go with me, then let me go. He sat at the bar and pushed me away. I came back and checked on him occasionally, but he was always holding his own. As usual, he didn’t need me. It was a night filled with hugs and sheer happiness. Many shared memories, laughter and a few tears. Many more hugs. Not everybody recognized me and I didn’t recognize everybody. We are 58/59 years old. We aren’t supposed to recognize everybody. Some of us were chubby, some were skinny, some were botoxed (okay, lots of botox), some were gray haired, some of us had time to visit the stylist before the party. There were even some fabulous new breasts! Me, I had fabulous new shoes. They were green platforms. Julie is the proud new owner! I left those bad boys in Mt. Airy! It didn’t matter if you were popular or if you were barely known. There was somebody there that was thrilled just to see you. And if you weren’t there, there was somebody that missed you. We are all scared. We are all flawed. We are all busy. We are all taking care of something or somebody else. But for one night, we were 6 -18 years old. We went to North Main, Rockford St. South Main, Bannertown, which led to Mt. Airy Jr. High, then to Mt. Airy Sr. High. We were the class of 1973. If you planned this, I thank you. If you couldn’t go, I hope you will go to the next one. We really, really missed you. And, if you are reading this, thinking it doesn’t matter if you don’t go to your class reunion, believe me, it does matter. You are that important.